Fresh off a hard fought defeat to Invicta FC Flyweight Champion Barb Honchak, Brazilian veteran Vanessa Porto again faces a stiff test when she takes on Zoila Frausto Gurgel at Invicta FC 7 on December 7th. 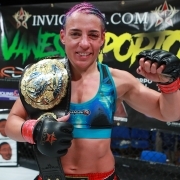 With the judge’s decision at Invicta FC 5 leaving a bad taste in her mouth, Porto is aiming for a knockout on December 7th; hers or Gurgel’s. With standout submission skills, and a focus on improving her Muay Thai, fans should not blink come December 7th. Corey Smith: Your passion for marital arts was ignited your first day of training. How do you keep that passion alive through the grind of a training camp? Vanessa Porto: My passion stays alive because I love what I do. Being a fighter is a very tough job but this is what I love and I’m blessed that I am able to keep doing it. The will to win and all my training partners and my husband/coach keep me motivated. Now that WMMA is getting so big, the stakes are higher and the girls are getting better so that motivates me to be on top of my game. CS: You train in Brazil for most of your camps, but also spend time at MMA University in New Jersey right before any fight in the United States. How does the split benefit you? VP: I train with my husband in NJ and Brazil so I’m happy either way. Training in America at the MMA University has given me more opportunities and better training partners. I feel like things are a little more advanced here. CS: With training camp injuries a common occurrence in MMA, how do you balance getting the full amount of training that you require but still guarding against injury? What does a typical day of training camp entail for you? VP: I get physical therapy sessions and massages after training. Accidents do happen in this sport but we try and train smart to prevent injury. VP: It depends on the day but always do my running in the morning and a physical conditioning session and then two training practices whether its Muay Thai or BJJ or MMA sparring. Since Zoila has very good Muay Thai we have been training a lot of Muay Thai to counter her strength. It’s going to be a war. CS: How would you describe the growth of MMA in your home country of Brazil over the past few years? 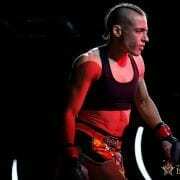 CS: You most recently competed against Barb Honchak at Invicta FC 5. What did you learn from that bout? 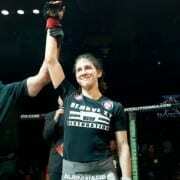 CS: Your opponent at Invicta FC 7 on December 7th, Zoila Frausto Gurgel, is a well known and accomplished competitor. What are you expecting out of the bout? VP: I’m expecting Zoila to be very tough. She is with a good camp as well. She is very well rounded. She has very good Muay Thai, but I do too. I feel like I will be more powerful and I plan on using that power in our stand up exchanges. She’s a former champion and a great test for me. There are no easy fights in Invicta. VP: I have been fighting professional for almost 10 years. I stay calm the whole day. I like to focus on my fight and I don’t do much talking on fight day. I get serious. No rituals though. VP: My husband/coach Pedro Iglesias is always in my corner. He knows me well and always give me good advice. My manager Chris is flying out to corner me as well. CS: Aside from fight preparation, how much MMA do you watch purely for enjoyment? Anyone in particular that you are a fan of? VP: Yes I enjoy watching UFC. We always watch the fights and of course every Invicta if I’m not on the card. I’m a big fan of the sport. I like a lot of fighters. CS: If you could go back and give your younger self one piece of advice, what would it be? VP: Just to start my martial arts training earlier than I did. But I’m happy that I started in MMA when I did in 2004. I feel like I’m a pioneer in women’s MMA, especially in Brazil and now I get to enjoy the WMMA boom when I’m in my prime. Twenty years from now I can look back and be very proud that I helped pave the way for all these talented women fighters coming up now. VP: I would like to thank God first. My husband Pedro for dedicating his life to me and my manager Chris Vender for all the work he does for me. VP: Of course Invicta and Shannon for the opportunity they have given me. VP: My teammates at MMA University, especially Ricardo Ruiz, Javier Gonzales, Bobby Markowski, Erin Blanchfield and Katlyn Chookagian for all their sparring to get me ready and all the Muay Thai girls that have been brought in for this camp to prepare me. VP: Thank you for the interview.